In the evening on All Saints’ Day in 1894, ten Episcopalians met and made plans to form what became St. Paul’s Mission in Glencoe. 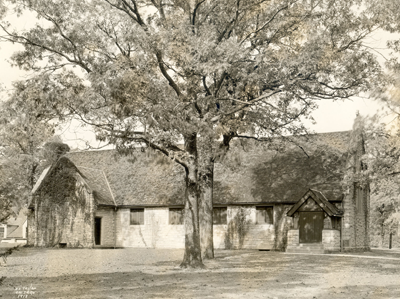 Services were first held in the Village Hall, presided over by various students from what became Seabury-Western Theological Seminary and later the mission was under the care and charge of the Rector of Trinity Church, Highland Park. Over the first decade of St. Paul’s Mission, the congregation grew, obtained its own Vicar, built a small wooden framed church, and later acquired the property of the present site where St. Elisabeth’s sits on Vernon Avenue. 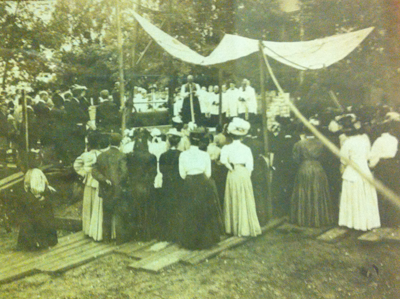 The Right Reverend Charles P. Anderson, Bishop of Chicago, laid the cornerstone for our present church in 1907. Designed as a blend of Gothic and Tudor styles by noted architect Mr. John Sutcliffe, our beautiful church transports visitors to the English countryside. Mr. Sutcliffe, an Englishman who moved to the United States in 1886, also designed St. Luke’s Episcopal Church in Evanston and Grace Episcopal Church in Oak Park. The church structure was consecrated on April 26, 1908. At the consecration, St. Paul’s Mission was also formally made a parish church and named the Church of St. Elisabeth. The building was given as a memorial by the Vicar, and upon becoming a parish our first Rector, the Very Reverend Luther Pardee, in memory of his mother, Mrs. Elizabeth Pardee. Over the years St. Elisabeth’s continued to grow and expand. The present Parish Hall, for which only the basement level had been built and a roof placed on top, was completed in time for the 50th Anniversary of the founding of St. Elisabeth’s in 1944 and includes the Parish Offices, classrooms, Guild and Dining Rooms, and Choir Room. The Parish Hall was further renovated and expanded in the late 1950s, the Chapel of Christ the King added and furnished in this expansion, and the current windows flanking the sanctuary of the Church were installed. We are blessed with a beautiful church campus that extends to our ample church grounds. Our grounds include rolling grass lawns, perennial and annual flora that has been planted with much loving care, and even two giant oaks that are over 200 years old. In 1980 the outdoor Columbarium, adjacent to the Church’s south wall, was consecrated for use and compliments the beauty of the church grounds. The Rickards Memorial Garden, a living memorial and testament to two faithful members of St. Elisabeth’s, is on the south-west side of the church grounds. The most recent addition to our church grounds, the Bethany Garden Labyrinth, is a 90 foot outdoor garden labyrinth modeled on the famous labyrinth at Chartres Cathedral. This was completed in 2002 and is located on the far western side of our campus, at the convergence of Hawthorn and South Avenues. The labyrinth has received much attention and use by those in our community as well as attracting visitors from around the country – sometimes even from overseas! Other appointments and changes have occurred as the Parish continues to adapt and address future needs, ensuring St. Elisabeth’s will be a center of vibrant worship and ministry for many years to come.